Provides a more active and regular fermentation of the dough in a shorter time, producing excellent results and improved appearance, enabling products to be kept in an optimum state when baked. 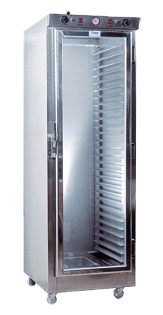 Dry and/or damp heat with independent thermostatic control. Reinforced structure with double insulated walls with a rapid temperature increase that is uniform and constitutes a considerable saving in electricity. Glass door to see inside without opening thus avoiding air penetration. Adaptable to every size and type of sheets by means of adjustable inside guides. Steam outlet valve and thermometer built in. Useful for heating, keeping at service temperature, and controlled defreezing of precooked dishes, butter, etc.